(Nanowerk News) Agar Scientific is a market leader in the supply of high quality accessories to assist with sample handling for the microscopy market serving a very broad range of application areas. 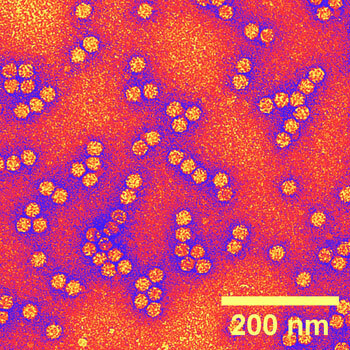 Successful Transmission Electron Microscopy (TEM) depends upon the quality of the specimen prepared and the ability to successfully reproduce samples for analysis. Until recently, "success" was a relative term and an elusive target. Conventional TEM grids could work but it was often a cumbersome process resulting in a lack confidence in the results. Dune Sciences produces a complete line of unique grids and protocols available for materials science and biological specimen preparation. These new chemically functionalized grids, called SMART Grids™ offer an unparalleled, repeatable, and reproducible platform for preparation and dynamic experimentation of nanoparticles and biomolecules. Speaking about the use of SMART Grids, James E Hutchinson, PhD, Lokey-Harrington Chair in Chemistry, 2009 at the University of Oregon and Co-Founder of Dune Sciences, says "We can't do our research without SMART Grids. In my lab, we use green methods to design and synthesize functional nanomaterials. Our end goal is to formulate useful engineered nanoparticles, and developing rapid and detailed characterization protocols is essential to our research. SMART TEM Grids were created to enable dynamic experiments to be performed with fast, accurate, reproducible and quantitative results." This has recently been backed up with a peer reviewed paper in ACS Nano ("Generation of Metal Nanoparticles from Silver and Copper Objects: Nanoparticle Dynamics on Surfaces and Potential Sources of Nanoparticles in the Environment"). Using SMART Grids, researchers at the University of Oregon developed a method to directly observe microscopic changes in nanoparticles over time. They were able to monitor transformations in size, shape and distribution over a few hours, especially when exposed to humidity, water and light. These findings showed that nanoparticle 'size' may not be static, especially when particles are on surfaces. For further details of Dune Sciences products along with Agar's complete range of accessories and consumables for microscopy, please ask for a copy of the latest catalogue and price list. To receive your free copy, please visit www.agarscientific.com and register today. Agar Scientific will also be exhibiting at emc2012, Manchester, September 17-21st. Visit their stand #713 to meet staff and look at a selection of Agar's broad product range. 2012 sees Agar Scientific celebrating forty years as a leading international supplier of consumables, accessories and specialist equipment for all disciplines of microscopy. The company has manufacturing facilities for the production of calibration specimens, grids, apertures and filaments. This is backed by an experienced technical team which has a wide practical experience in specimen preparation and microscopy techniques, and can assist you in the selection and use of Agar Scientific products. From their UK headquarters, Agar provides a fast and efficient despatch service from their extensive range of stock items. Looking worldwide, a network of agents and distributors can supply you locally as appropriate. Agar offers a complete online catalogue of consumables and accessories for electron and light microscopy to meet the needs of all working in biological and material science related fields.